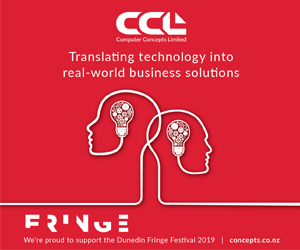 Comedy, music, performance, theatre, and anything in between - the Dunedin Fringe Festival is back for 2019! The dazzling lineup features over 80 acts from local haunts and far away lands. Director Gareth McMillan is “thrilled” with the variety of talent on offer. “The quality of this year’s lineup is higher than ever; there is truly something for all Dunedinites to experience.” Running for eleven days from March 21st-31st, there is something for everyone in this eagerly anticipated annual highlight. Go to www.dunedinfringe.nz for details. The festival is kicked off by the ever-popular Polson Higgs Opening Night Showcase on March 20th, this year hosted by Dunedin’s iconic Regent Theatre. The Showcase offers a tasting platter of fringe delights, with five minute previews of a range of talented performers. The night is jam-packed with talent, including the vivacious MC’s Jesse Griffin (Wilson Dixon) and Tahu MacKenzie, house music by INATI, and vibrant performers such as James Mustapic, Charmian Hughes, and cabaret collective Four Night Riot. It’s the perfect way to test the waters, and then go out and experience the full shows for yourself. Highlights of the full programme include top Kiwi comedians Ben Hurley and Chris Parker, and returning fringe favourite David Correos. Local musician Phil Davison, better known as Dr. Marigaux, presents his one-man black operetta JackS the Ripper. Originated by New York’s Heidi Latsky Dance Company, the global event On Display comes to Dunedin, a living art gallery of human sculptures celebrating diversity and inclusivity. The latest creation by local theatre company Talking House, Toy Factory Fire is an immersive audio visual installation based on the Kadar Factory Fire. 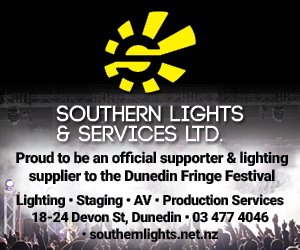 The city of Dunedin is embraced by the fringe, with a record 43 venues in the city centre and stretching outwards to wider Dunedin areas. Little Paisley, a solo visual art show by Holly Aitcheson, is inspired by the rich history of the Southern Cemetery. The show will be on at another oft-overlooked location right in the Octagon, the Crypt at St Paul’s Cathedral. Written by 2019 Burns Fellow Dr Emily Duncan, Le Sujet Parle: And Then He Shot Me combines performance and immersive projections at Otago Museum’s Beautiful Science Gallery. The Dunedin Botanic Gardens is the location for Trickster Game 001, a live-action video game inspired adventure through the garden’s maze-like paths. The biennial Lines of Flight experimental music festival is back at two venues, the Dunedin Public Art Gallery and Port Chalmers Pioneer Hall. A festival staple, the Emerson’s Festival Club will be back in the Community Gallery on Princes Street, providing a venue, bar, and post-show chill out hub for festival goers. The club is also the location for a number of sizzling shows. Hailing from Brighton, UK, Bear North is a comical musical odyssey featuring a dancing bear, wolf, and buffalo. Also from the UK, internationally renowned comedian Sameena Zehra makes her Dunedin debut at the club with her new show Arsebiscuits. UK natives turned Dunedin residents Ian Loughran and Aaron Davies present Bonkers Bingo, a hilarious interactive games night. The Festival Club also presents Perraux Audio Nights, with local music curated by Nadia Reid including Die Musikband, Lars Von Trio, Tiny Pieces of 8, and Rollercoaster.